This is Amy E. Anderson’s Long Story Short Scarf, a versatile pattern that’s more a recipe than a specific pattern. It’s available for download on Ravelry. 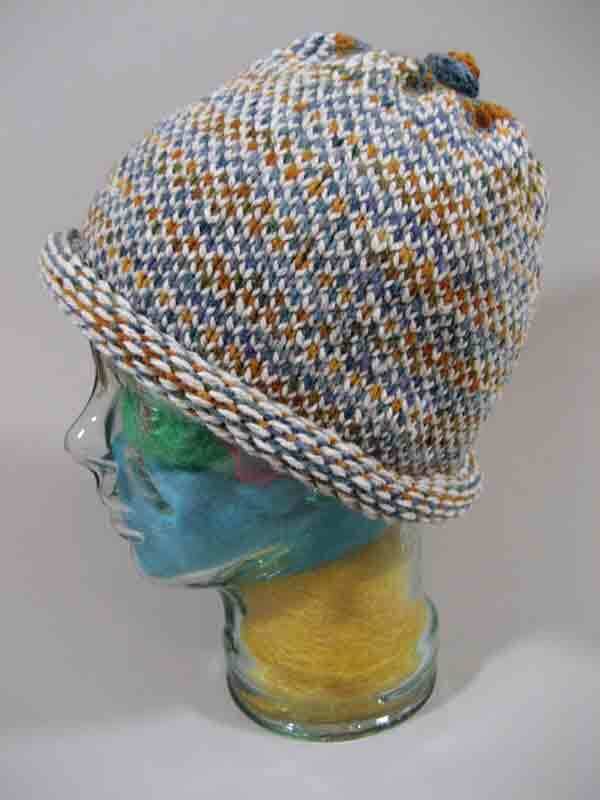 I purchased mine from Blackberry Ridge, kitted with their worsted weight yarn. 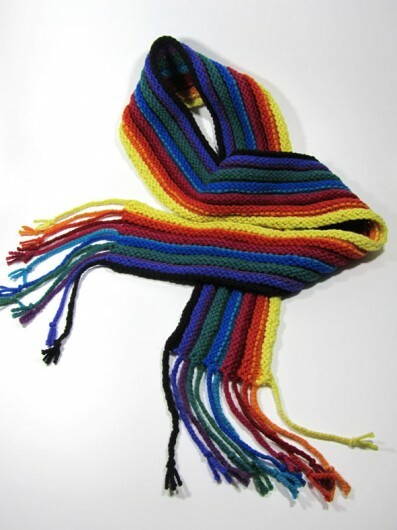 This pattern includes directions for scarves, shawls, baby blankets and afghans in your choice of 3 stitches. It is intended as a way to use up your leftovers. If you like, you can choose a new yarn at the beginning of every row and cut it at the end of every row. The Blackberry Ridge kit directs the knitter to use the “baffled” stitch from Anderson’s pattern. The direction for “baffled,” which is one of three choices on how to work the stitches, baffled me for a good long while. The directions say to “knit 3 right side rows, knit 3 wrong side rows.” Hmm. Pretty much us knitters alternate between right side and wrong side rows unless we are working on circulars, in which case we knit only on right side rounds. Here’s the deal: you must use circular needles. Anderson tells you that but doesn’t explain the why of it, at least I didn’t find the why anywhere. You knit one row, cut the yarn. Do NOT turn the needles around. Go back and join the new yarn starting at the same stitch you started with in the first row. And then do that for a third time. On the 4th row, turn the needles. Now you are working what Anderson calls a “wrong” side row (though there’s really no difference between the right and the wrong side). Do that same thing for 3 rows and start the next set of six rows. Easy peasy. I braided the fringe. I think it will hold up better that way and look a bit neater. It works out really well because there are 3 strands of each color on each end, so you end up with a fringe of one braid of each color–at least in my version that changed yarn color every three rows. Here’s a look at the Blackberry Ridge kit, which includes the pattern and sells for only $17.00. I purchased the kit from the Blackberry Ridge booth at Fiberfest in Allegan, Michigan. 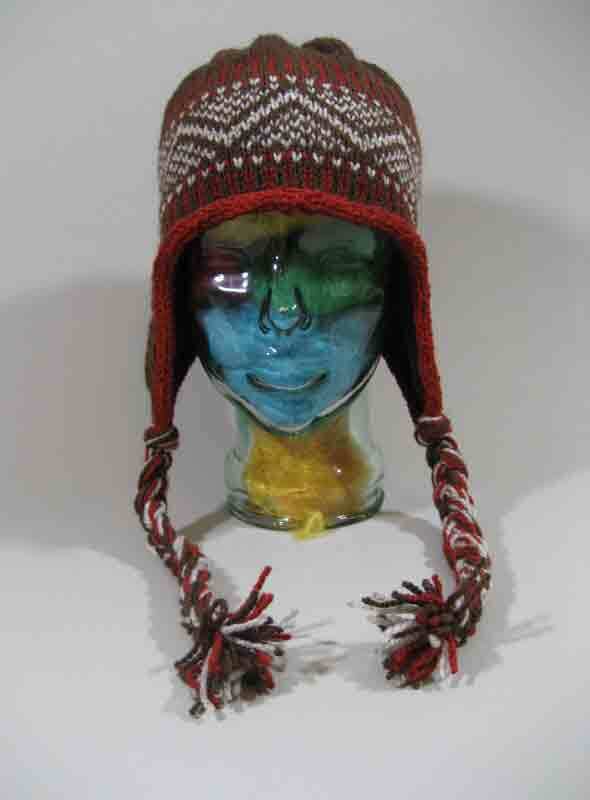 This Troll* knitted an earflap hat fit for Yoopers. ** And fit for anyone else struggling to keep a head warm in cold winter weather. This hat won’t make you look good. It will just make you feel good. The pattern is another Amy E. Anderson pattern: Durango. It’s available for download at Anderson’s Ravelry store. 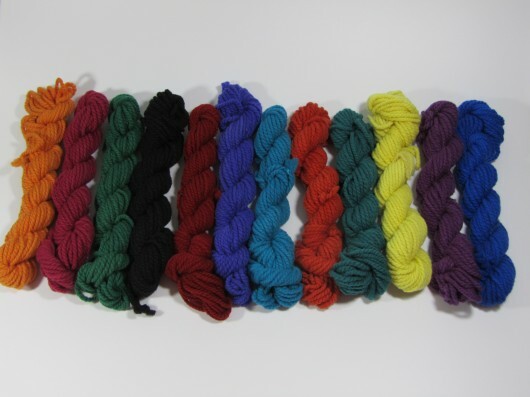 And Blackberry Ridge kits it up with their wonderful worsted, shown here. My only modifications were to use applied I-cord edging and to add the braids (using up some of the gobs of extra yarn included in the kit). 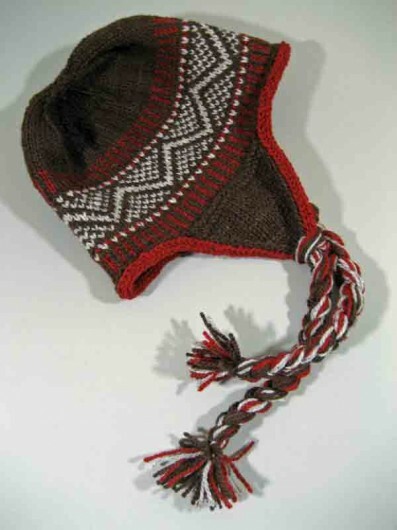 Nothing like a bit of easy fair isle to snaz up a hat. * A “troll” lives under a bridge, so that would be someone who lives in Michigan’s lower peninsula, below the Mackinac Bridge. ** A “Yooper” lives in Michigan’s upper peninsula, the U.P. This is Amy E. Anderson’s “Merrily We Roll Along.” The pattern is available through her Ravelry store and at Blackberry Ridge. I purchased my pattern at a local fiber festival, kitted up with about two ounces of Blackberry Ridge worsted weight in off-white and another two ounces of their multi-color worsted. The pattern is a threefer. It’s shown here in the simple “salt ‘n pepper” version. (Knit one stitch in one color, then one in the other color, then alternate on the next round). 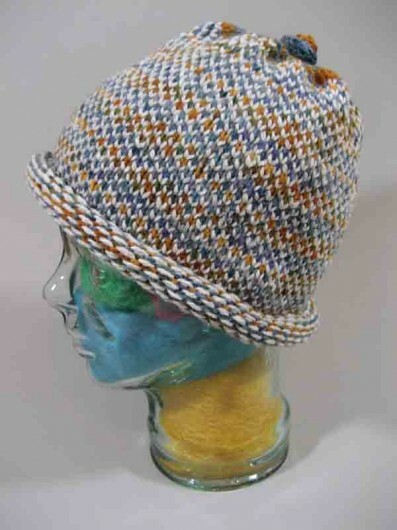 Anderson’s pattern also includes a vertical stripe version and a spiral-of-color version. All three versions eliminate the need to take any steps to avoid the dreaded “jog” at the round change. At the crown decreases, Anderson recommends you choose one of the yarn colors to finish off the hat. 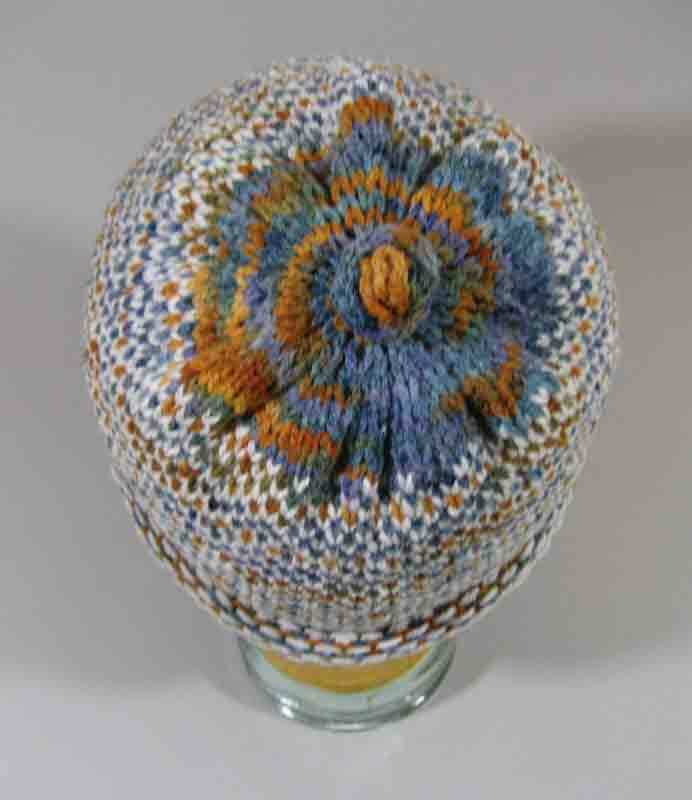 Next time I make this, I believe I will simply continue the two colors and just work the decreases in. The decreases are a bit abrupt, as compared to most crowns. That causes the crown section to bunch up, but it’s a design feature rather than a flaw and I like it. My only modifications were to work a row straight between all of the decrease rows. And I knitted down to four stitches, worked I-cord for about four inches, and then tied a knot to finish it off. “Salt ‘n pepper” creates a very firm fabric–so firm that the hat stands up on its own. That’s good. It will also stand up well to cold weather. 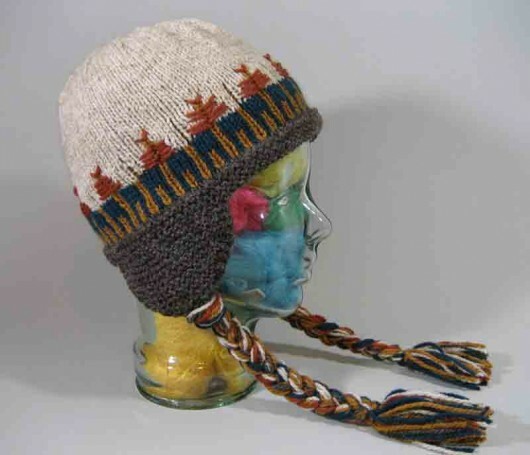 This is Marshlands, by Amy E. Anderson (Wigglyworld on Ravelry). It is knit in Blackberry Ridge medium weight wool yarns. For $16.00 the Blackberry Ridge kit is a bargain and there is an ample amount of yarn included. 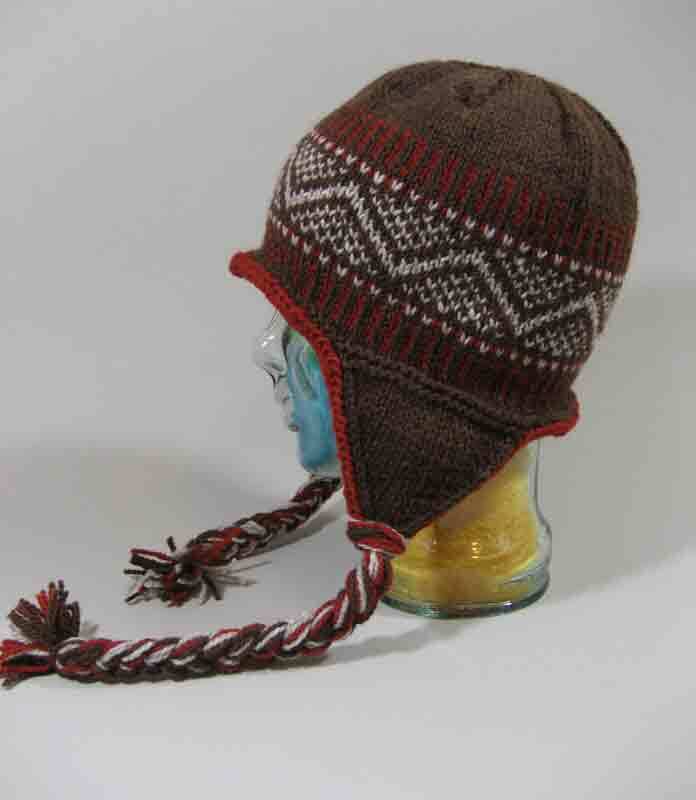 The pattern is also available in Amy’s Rav store. 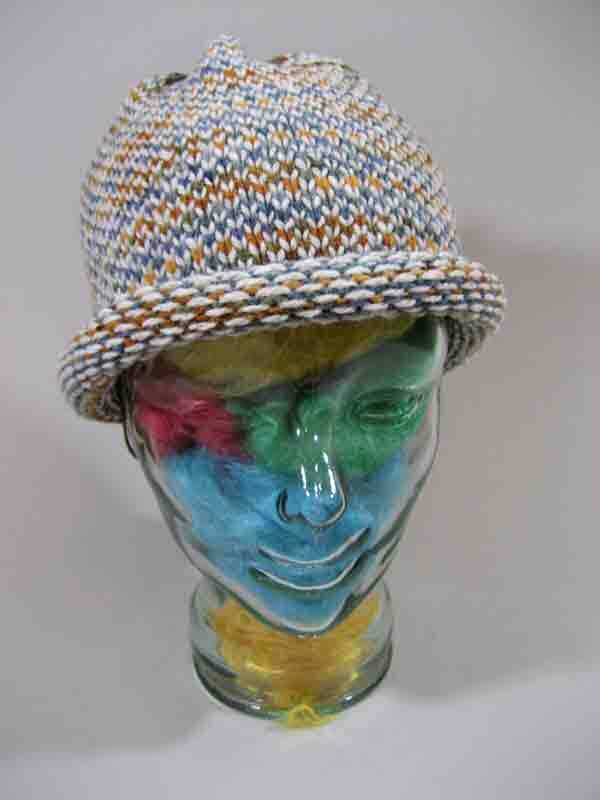 This hat is a very quick knit. 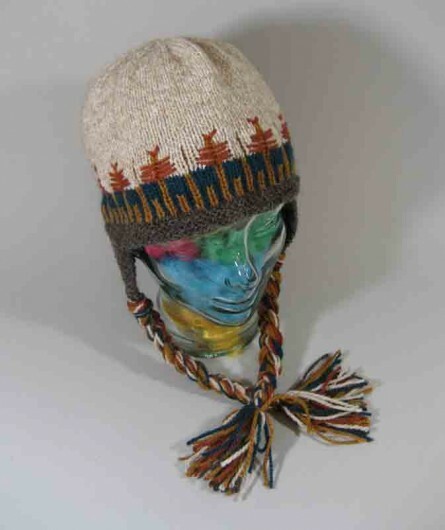 It would be an excellent first Fair Isle project. Embroidery is among the many needlecrafts that I never mastered, but Amy’s directions are very clear on how to embroider the tops of the reeds. “In at point one, out at point two, in at point three…,” all nicely charted. It has been observed that my reed tops look more like dead Christmas trees, but we won’t discuss that right now. This hat looks incredibly dopey on my head. Sad to say, but true. But I had Sara, the granddaughter of my neighbors at the lake, try it on and she looked cute as a bug’s ear. My question to Sara was “braids–on or off?” She voted to keep the braids on, and so I did. Amy’s pattern called for more diminutive six-strand braids.